For Juniors, we hold the monthly Red, Orange and Green team leagues and matchplays as well as the Road to Wimbledon competition and the National Aegon Team Tennis plus grade 5 and 6 open tournaments. Individual lessons will help improve your tennis! Available to teach juniors and provide hitting practice. Junior squads every weekday evening and Saturday mornings – includes coordination skills, matchplay technique and fair play tuition. 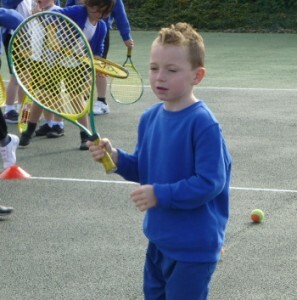 Tots Tennis-we run 3 sessions per week and these include agility, balance, coordination, counting, teamwork, colour recognition, racket and ball skills and hitting the ball over the net. 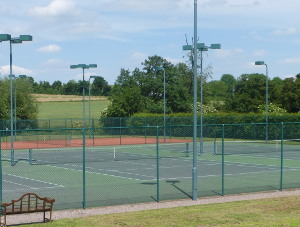 Cardio Tennis - 3 Sessions per week which involve tennis drills and movement with accompanying music, designed to increase the heart rate in a safe manner and it is also great fun. Teenagers can include tennis as a skill or as a volunteer for the Duke of Edinburgh awards scheme. Work experience is offered to pupils at local school. We also provide video proof of playing ability required for GCSE courses. These are fantastic value for money, honed over several years and participants show tangible progress over the 3 days. There is a 1 coach to 8 juniors ratio and wet weather provisions.